Some tips on how to make your kids lunchboxes both exciting and healthy. Dried-out sandwiches with boring peanut butter or discoloured fillings hardly appeal to a child who needs an appetising, nourishing snack to keep mind and body active. Mothers in today’s rushed world - driving and dropping, shopping, washing and cooking – can’t be blamed for taking the easy way out and giving their children tuck shop money if their kids keep on returning their lunch boxes with yesterday’s fare untouched. A child’s lunchbox should be packed with low calories. High calorie foods like chocolates, chips and biscuits often add up to a lot of excess fat and salt that may lead to obesity and in the longer term also to diabetes and high blood pressure. A high calorie intake may cause an instant spurt of energy, but will make children sluggish and cranky in the afternoon. High calorie treats should thus be allowed to once in a while, as a real treat instead of everyday lunch box fare. Montagu Dried Fruit & Nuts offers a good substitute for ‘packaged’ convenience food and will help your child to stay full for longer. Their raisin snack pack is a nutritional lunch box delight. 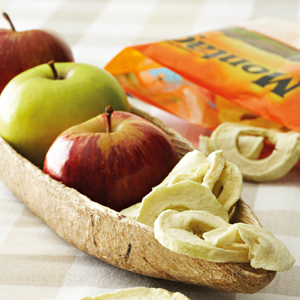 Lunch should be undeniably tasty too, but with the right fuel to keep your child going for the whole day. Your kids should be looking forward to their lunch and eat what’s been packed. Various suppliers have fun and tasty products to brighten up the lunch box. Montagu Dried Fruit & Nuts offer lunch box favourites such as fruit flakes, yoghurt covered nuts and, as that special treat, caramel coated popcorn. Make sure that your kids’ lunch boxes contain foods with high nutritional value. Cape Town dietetics consultant Megan Pentz-Kluyts says carbohydrates supply the bulk of the energy and is in line with South Africa’s national guideline for healthy eating. “Make starchy foods the basis of most meals,” the guideline advises. Bread or other starchy foods such as rice are good sources of carbohydrates. Each lunch box should also contain a source of protein such as meat or boiled eggs. If you don’t have time to boil an egg there are easier options, like nuts. As children also need five servings of food or vegetables a day, it may be practical to add dried mango strips, apple rings or a fruit or vegetable smoothie. Cheese cubes or yoghurt should also be added for your child’s calcium intake. The C in lunch stands for creative. Peanut butter or jam sandwiches are not. Bran muffins with added fruit, such as pureed apples or banana, or cupcakes with nuts, are creative. Get your child to share in the fun. You can cut bread, meat and cheese into cubes and slide them on a stick with cherry tomatoes and lettuce in between. Another idea is to use cookie cutters to cut out fun shapes for bread and cheese. A bracelet of Montagu’s Dried Apple Rings will add a lot of appeal to all these choices. High fibre is an important requirement, yet lacking in the average South African child’s diet. As far back as 2006 an article published in the South African Journal of Clinical Nutrition conclude that children between the ages of one and nine had an inadequate intake of the insoluble dietary fibres that are needed to keep digestive systems healthy and able to absorb growth and development nutrients. A good suggestion is to read food labels and to choose foods with high fibre content. Start the day with a breakfast cereal that contains high fibre, like Weet-Bix, and choose seed loaves, low GI bread and whole wheat and rye from the bread counter. And for those who didn’t know, air-popped corn (popcorn) makes a good fibre-rich snack. For more information visit www.montagudriedfruit.co.za.